We are truly blessed with a beautiful country that is filled with so many natural wonders—so numerous indeed that it is virtually impossible to visit them in a lifetime. In fact, for the moment, Sweetie and I have not made any concrete plan to travel outside the country unless a good opportunity presents itself. There is just so much in the Philippines to discover, explore, and enjoy. 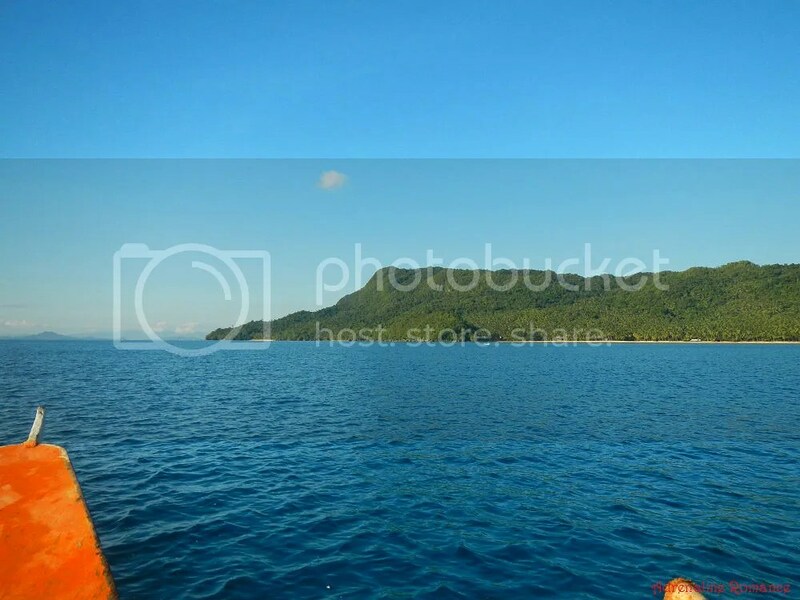 Recently, the Philippines has experienced a significant increase of foreign tourist arrivals. There are a number of factors attributing to this increase—opening of new regular and chartered air routes, increase in cruise itineraries, and aggressive tourism campaigns by our own DOT. But more importantly, foreigners seem to have developed a profound and steadily growing awareness of the richness, serenity, and excitement that is in store for them in our country. So why not visit our own destinations first so you won’t be a stranger to your own country? 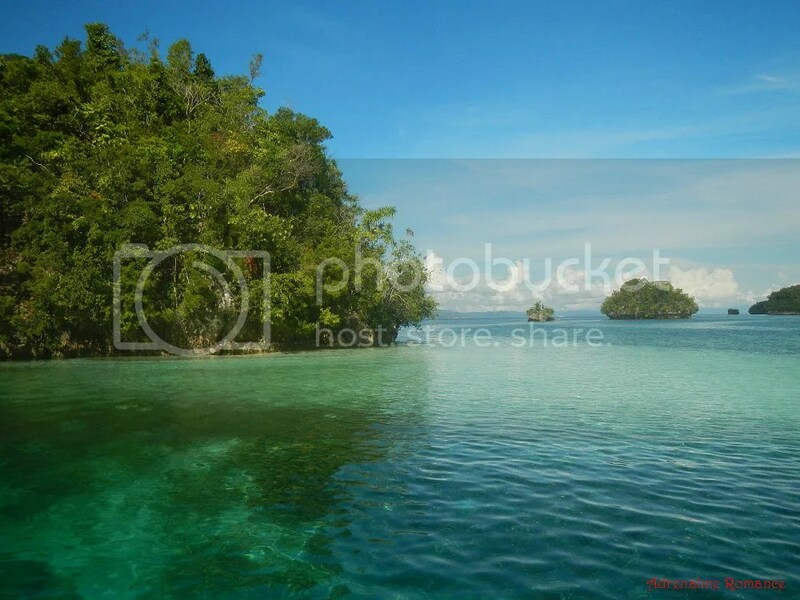 Why not visit our very own wonders such as the mystical and serene Sohoton Bay in Bucas Grande, Surigao del Norte? As adventurers, environmental preservation advocates, and ambassadors of tourism, we hope that this humble story of ours will inspire you to visit this quiet and magical corner of our homeland. Sleeping early the night before an exciting adventure always gives us a chance to witness one of Mother Nature’s spectacles. We were totally ready by 5:30 AM, so we walked to Socorro’s pier to quietly watch a dazzling sunrise. The scene was one of tranquility and life as some of Socorro’s citizens shook the night off and started their daily routines—swimming placidly by the port, hawking a fresh harvest of vegetables, or simply sipping a cup of hot coffee while recapping last night’s episodes with chatty neighbors. Life in Socorro is so relaxed that no carenderias except one near the pier was open even though it was a bit past 6 AM! In most other places we visited, carenderias start serving food well before the crack of dawn! Well, we found out that most business establishments in this remarkably peaceful corner of the Philippines open later in the morning, sometimes later than 8 AM! While waiting for our breakfast , Sweetie kept up her morning exercises by following a zumba instructional video being played in the eatery. Meanwhile, I visited their marketplace to observe the growing but pleasant morning din as locals started to pour in. While we were having a hot breakfast, a pleasant guy came to us and asked if we are Sheila and Gian. Yes, our guide, Sir Vincent Tamayo, found us even though we were supposed to meet him at the pier! He did not know us from Adam except perhaps from a mere mention by Sir Aga, the tourism officer. How did he know where we were? We exchanged pleasantries, had a short briefing, and let Vincent and his boatman enjoy their breakfast. After buying our packed lunches, we proceeded to his nice, fast pumpboat. With everything secured, we cast off from the pier. Goodbye, Socorro! We’ll see you back in the afternoon. Along the way, we were treated to an awe-aspiring view of largely verdant and pristine Bucas Grande. See those white strips on the island? Those are actually white-sand, untouched, uninhabited beaches. 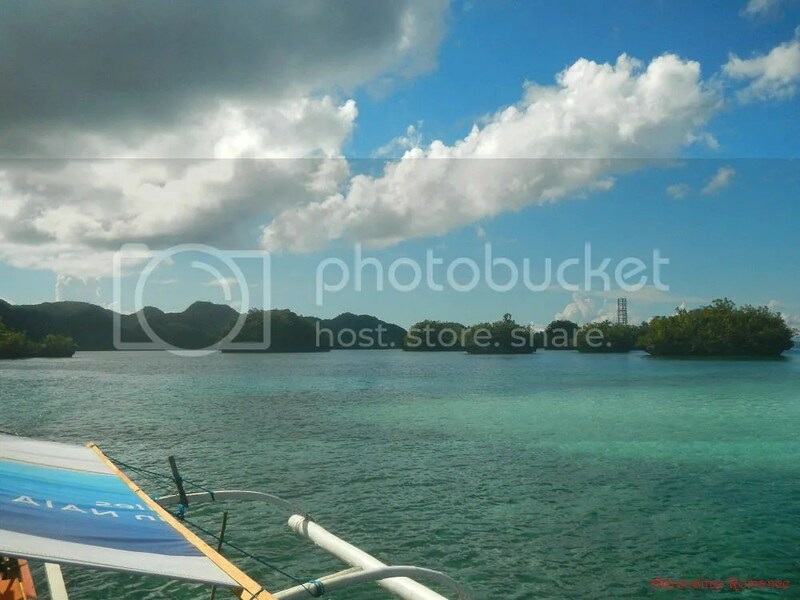 It was a good thing that we started our island hopping adventure in the morning since the sea was still calm and smooth. We made a special video of Sohoton Bay for you, dear readers, so you can see just how unimaginably beautiful this place is. The bay is home to secret lagoons, azure waters, stunning forest-covered islets, lovely sandbars, amazing coral gardens, and more. It’s actually good that mainstream tourism hasn’t made a significant encroachment in this area yet. Hopefully, it stays that way. Awesome rock formations, carved by Mother Nature for eons, line the southern end of Bucas Grande. But it only takes man a couple of years to destroy what Mother Nature lovingly created for millions of years. Across the sea is an entire mountain range that is being scalped through open pit mining. Those gigantic ships in the foreground haul iron-rich soil to refining plants around the world. This sad sight is located at the boundary of Surigao del Norte and del Sur in mainland Mindanao. We passed by this mine during our Caraga Region tour, and the scene there is truly heartbreaking—a stark contrast to the lovely wonders here in Bucas Grande. 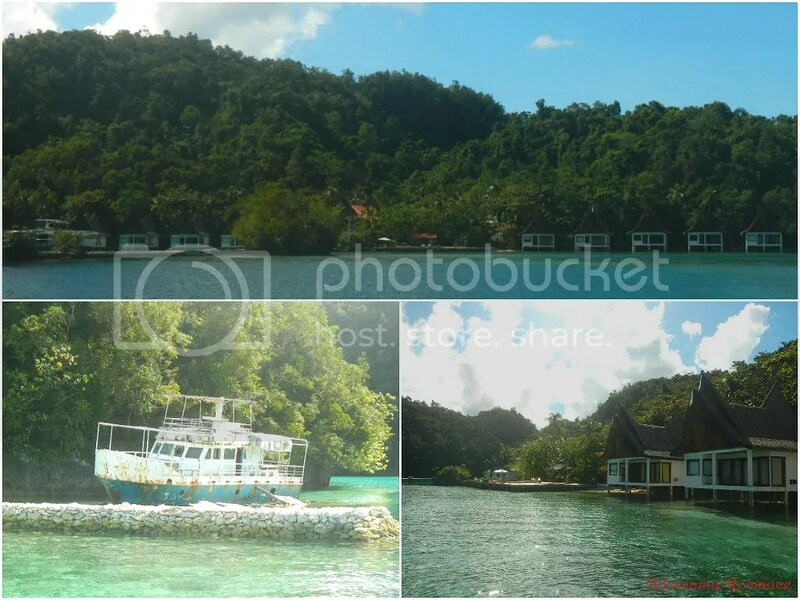 Despite being largely undeveloped, Sohoton Bay, with its unique beauty, has certainly attracted investors associated with the travel, tourism, and hospitality industries. As we skirted along the bay, we saw high-end resorts like these being constructed in certain areas. This is fine; resorts of this kind can provide jobs and improve the local economy. However, care must be taken so that the beauty of the place will be preserved and its ecosystem protected. Along the way, we saw several beach resorts that line up the southern edge of the island. White-sand shores plus swaying palm trees plus emerald waters equal a perfect paradise! Huh? An electric post in the middle of a lagoon? Unsightly? Yes! Helpful? Definitely! These posts form part of a system that provides electricity to farming communities in this side of Bucas Grande. After passing by the electrical post, Sir Vincent signaled his boatman to stop the engine and let the boat cruise using its own inertia toward this quiet, green lagoon. What could be in this place that warrants an engine shutdown? 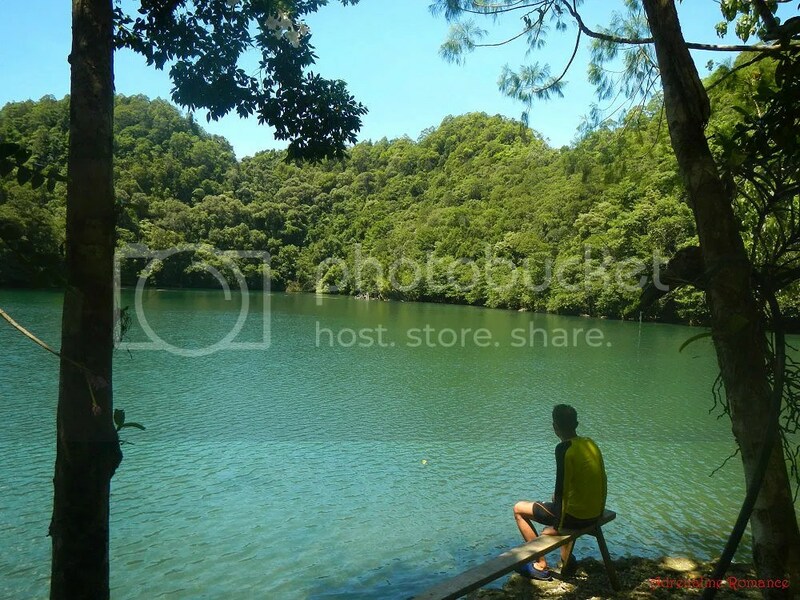 It turned out that this large lagoon is a natural spawning area of stingless jellyfish! And there were hundreds of them as far as we can see! Beyond excited, Sweetie and I quickly donned our masks and snorkels and dove right into the spawning lagoon. The lagoon at Isla Noah is home to two kinds of stingless jellyfish. The first is the spotted jelly (sometimes called the golden medusa), which is golden brown in color with its head featuring light-colored spots. Using its oral arms and several mouth openings, the spotted jelly feeds on microscopic zooplankton. The second kind is the moon jelly, which is translucent and easily recognized by its four horse-shoe shaped gonads on the top of its head. It feeds on plankton, mollusks, and other invertebrates. 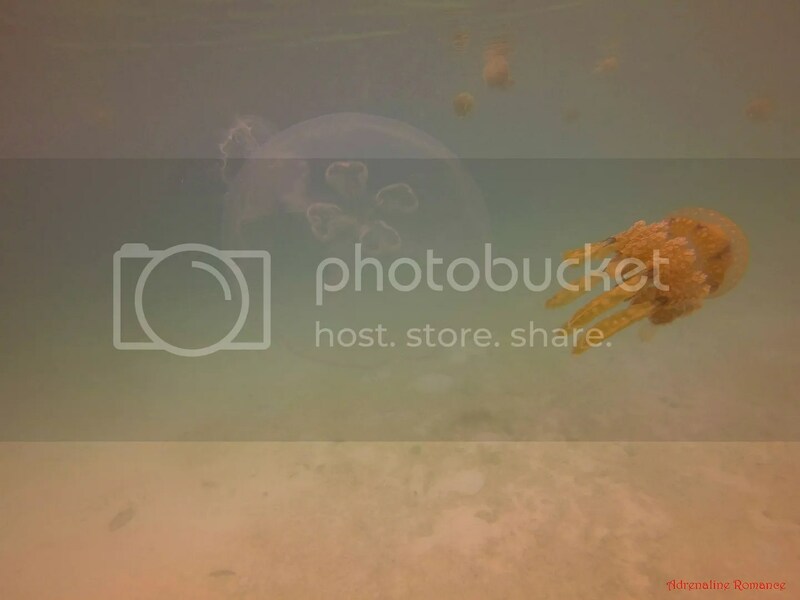 Both kinds of jellies have limited motion, so they drift with the current. They cannot see but can distinguish between light and dark. 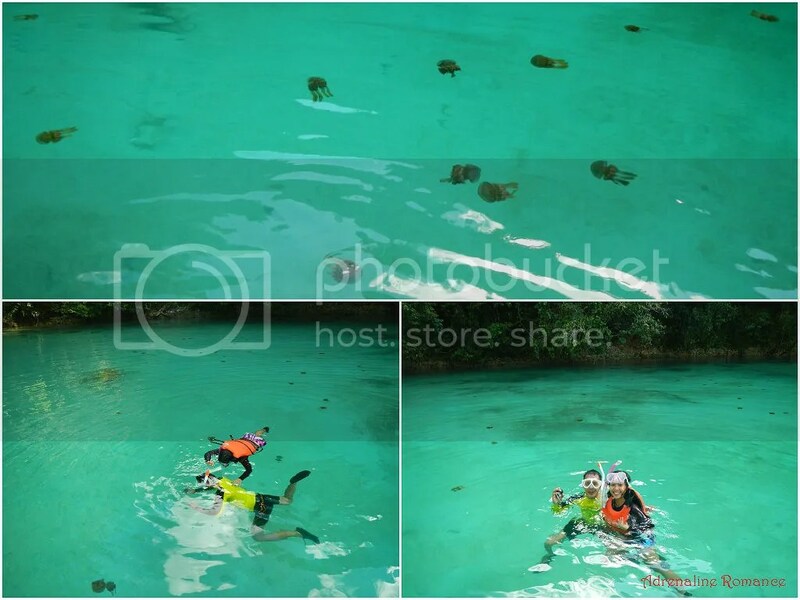 Swimming with cute, graceful, and stingless jellyfish in Isla Noah, Bucas Grande truly instills a sense of serenity. Our hearts were simply filled with peace as we saw them dance and play around us. Check out our video below. As we mentioned before and as shown at the beginning of the video, the boatman shut off the vessel’s engine. Now we understood why. They have to take extra care (e.g., shutting down the engine, using paddles carefully to maneuver the boat, etc.) to avoid harming the delicate jellyfish. After an hour (yes, a whole hour!) of playing with our gentle marine friends, we departed from Isla Noah and continued on with our journey. 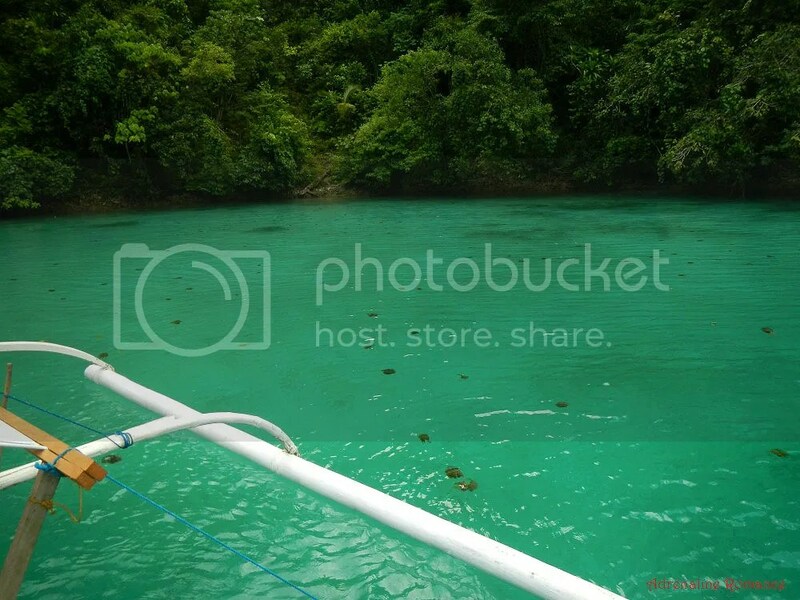 We cruised through the emerald lagoons of the Bubon Group of Islets. 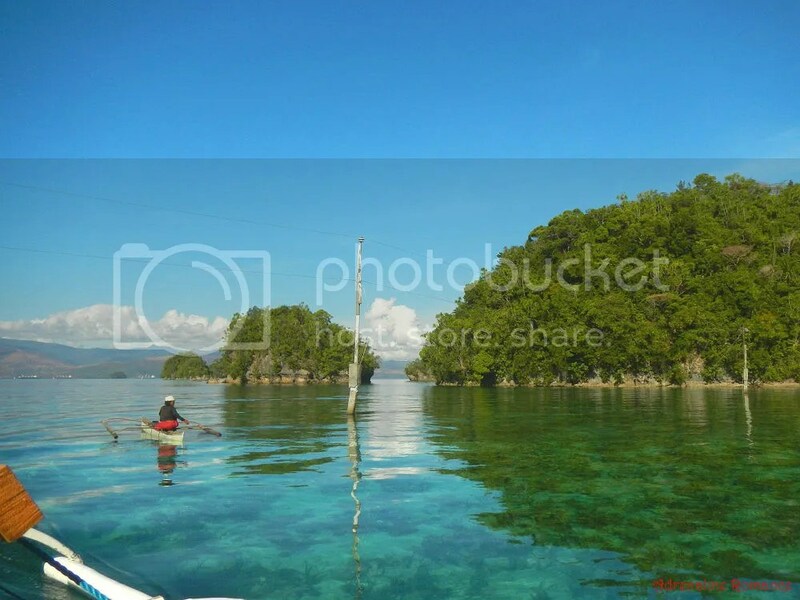 The islets are very similar to those belonging to the popular Hundred Islands in Pangasinan. 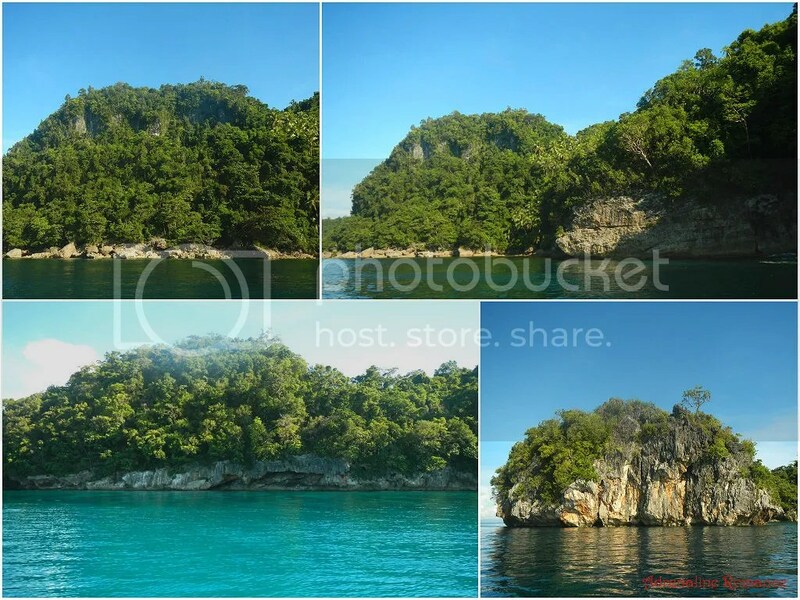 Each island features cool rock faces, sandy beaches, and green mini-forests. That tower in the distance? That’s a newly constructed, recently opened zipline tower. 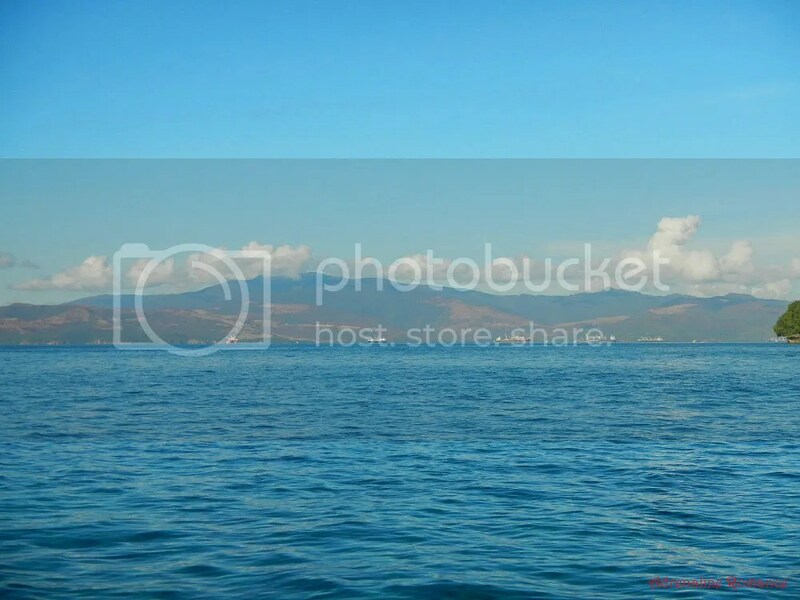 Some islands have shallow, submerged sandbars. Sir Vincent said that these are perfect areas for children and people who don’t know how to swim but who still long for the ocean’s caress. Despite fishing trawlers and modern fishing implements, many locals still practice the ancient way of fishing in the rich waters that surround Bucas Grande—-through the use of a line, hook, and sinker. 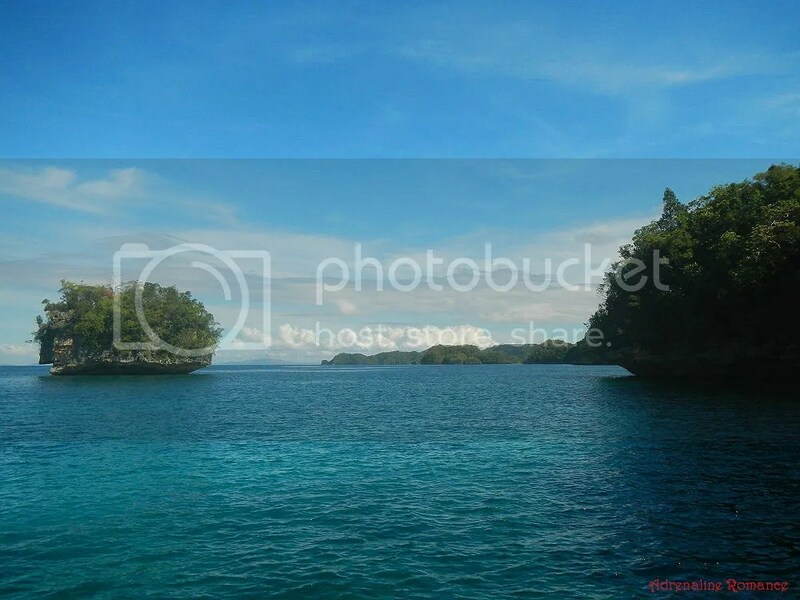 As we entered the southwestern tip of Bucas Grande, the gateway to Sohoton Bay, we saw another distinct group of islands. 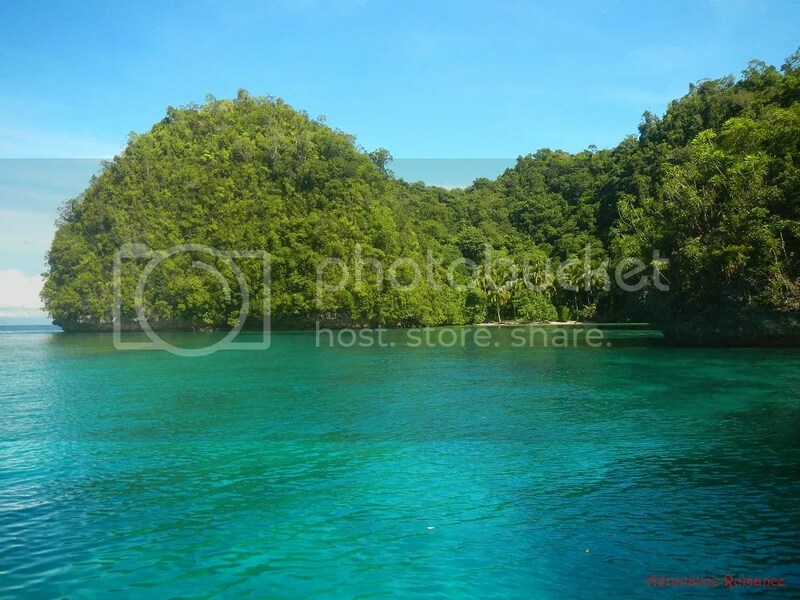 Sir Vincent said that this is the Banderahan Group of Islets. Why the weird name? Well, during World War 2, Japanese soldiers once raised a few Japanese flags in some of these islets. Thus, locals started to call the place banderahan, or “place of flags.” The name stuck with the locals until today. 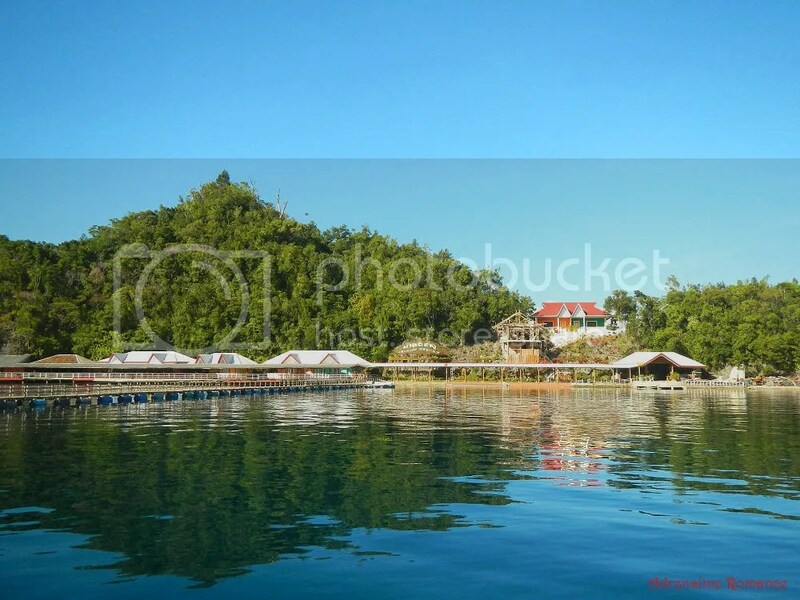 We passed by Club Tara, a first-class, five-star resort in Surigao del Norte. 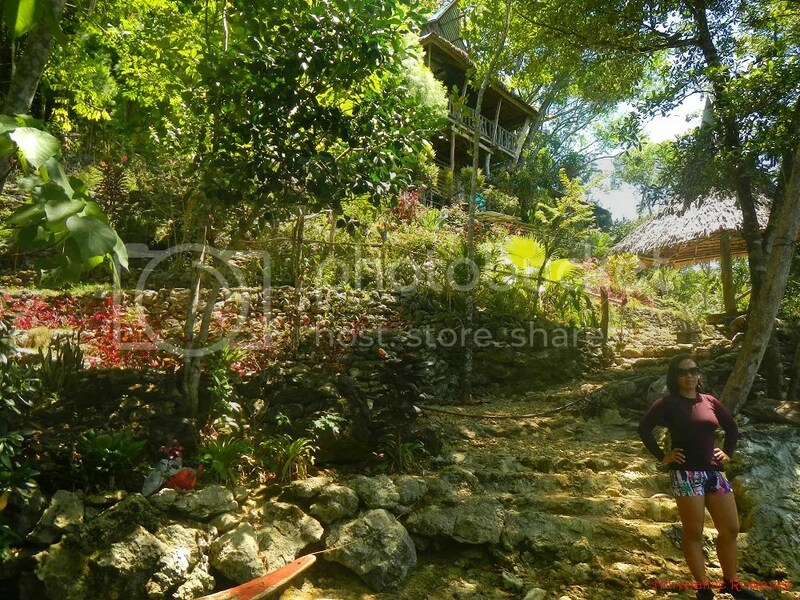 A stay in one of those stilt-cabins can cost you around Php 5,000 to Php 10,000 per night! Of course, the price presumably comes with interesting perks. But the figure is way beyond our budget; the price of one night alone can fund one of our multi-day adventures. However, we wouldn’t want to give up the chance to stay in a five-star resort; actually, we haven’t tried staying in one! 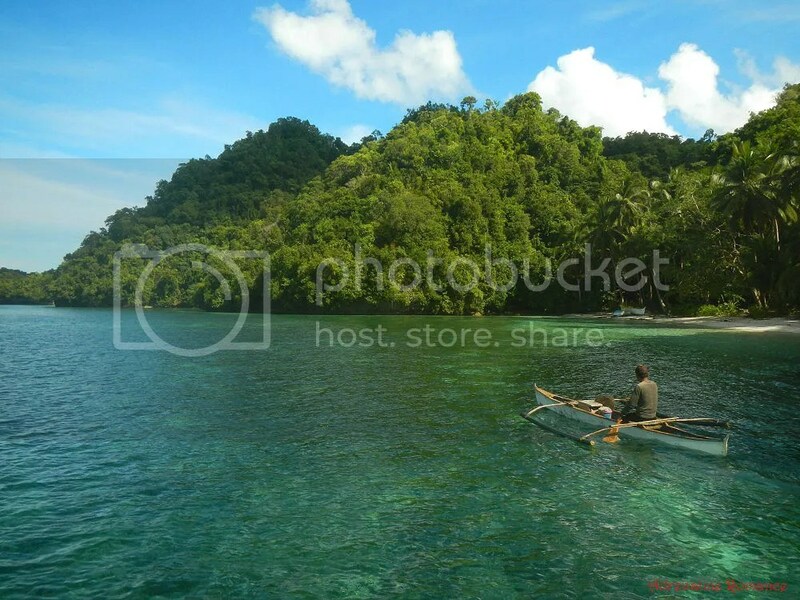 That’s just one of the beautiful islands in Banderahan. It’s so tempting to simply dive in the water or dock on the shore to explore any of these islands. . .
. . . which we found out later that we were going to do exactly just that! On our way to our next destination, we cruised along this wide channel of water. It was so clear that we could actually see coral formations, sand beds, and individual rocks below us. We arrived at a secluded lagoon with nothing but an empty hut, a viewing deck, and a flight of carved stairs leading somewhere in the island’s hills. The caretaker of the island emerged from the hut (he was probably sleeping when our arrival woke him up), had us sign a logbook, and handed us a pair of flashlights. All set? We took a short climb up the stone steps. 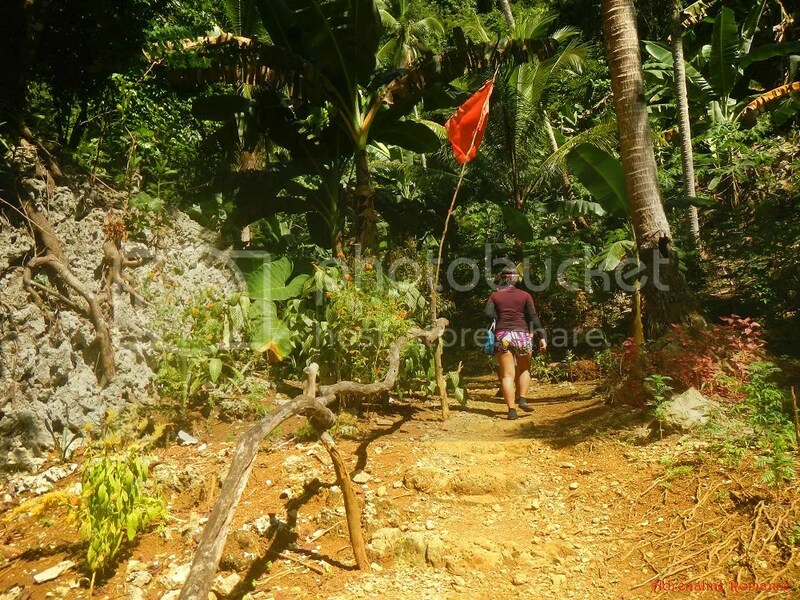 A short while later, we arrived at the entrance of the famed Crystal Cave and Bolitas Cave. We’ll tell you more of our caving experience in the next post. 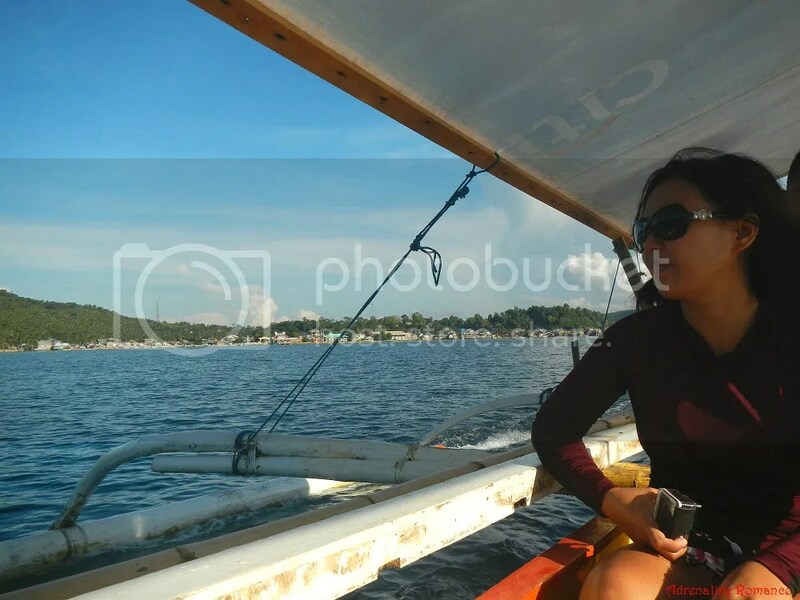 After exploring Crystal Cave and Bolitas Cave for more than an hour, we boarded the boat and allowed Sir Vincent to take us to our next destination. Along the way, we were simply mesmerized at how pristine and quiet this place is. In less than half an hour, we arrived at this small dwelling. 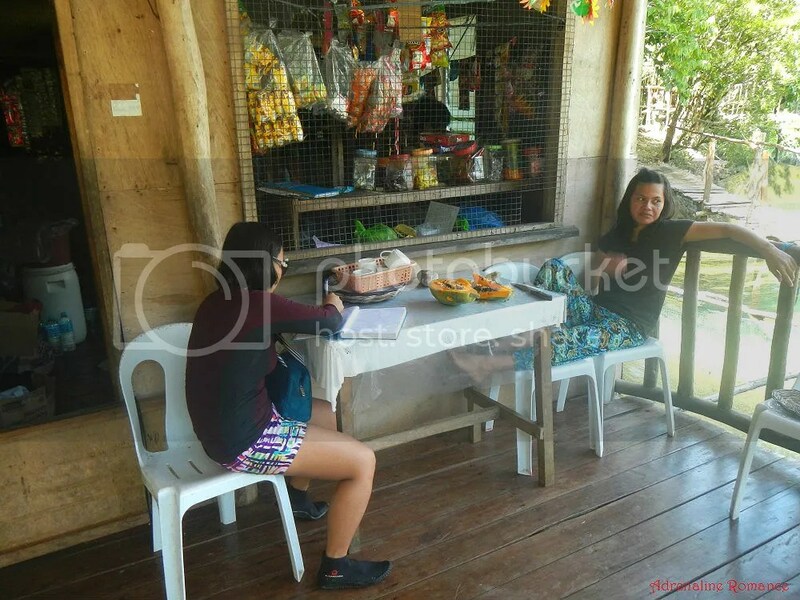 Wait, is that a sari-sari store in the middle of nowhere? Believe it or not, it is! And a house! And a registration center! So, if you feel hungry or thirsty during your island hopping trip, you can just buy snacks and drinks—in a store in the middle of nowhere! 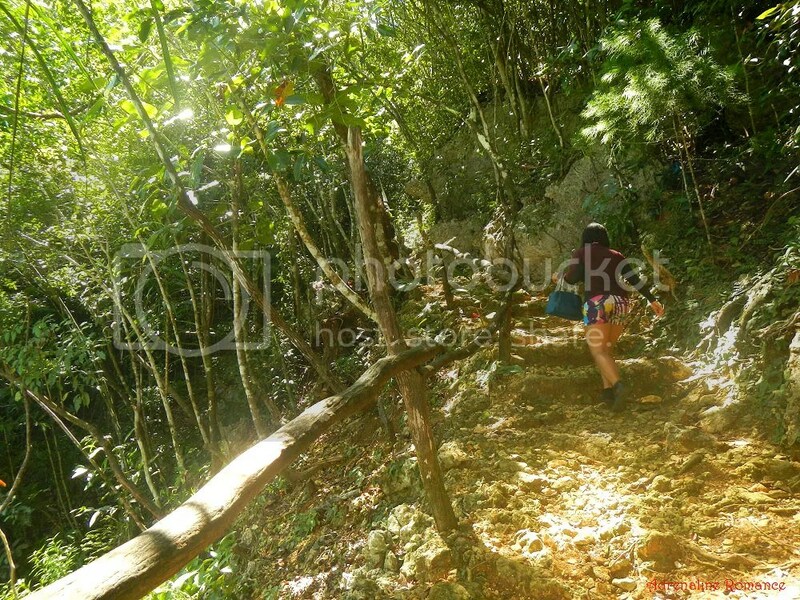 After registering and paying a small entrance fee, we hiked up an established trail carved on the hillside. The lofty trees provided that much-needed shade that is always a respite against the harsh mid-morning heat. 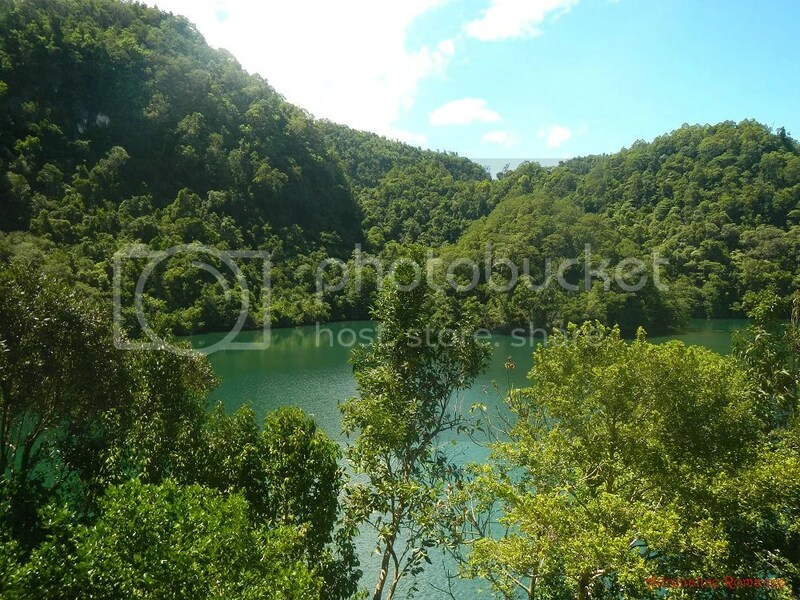 In a few minutes, we were treated to a stunning view of Tiktikan Lake, a lovely lake in the middle of a ring of karst cliffs that are overgrown with forest cover. 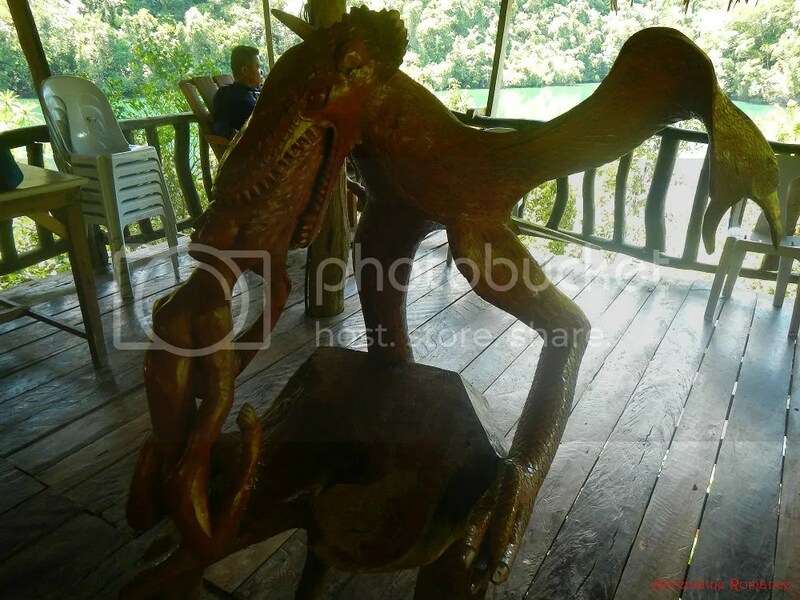 The common area, which is situated high above the shoreline, features amazing and detailed sculptures of mythical monsters. This area also offers an encompassing view of Tiktikan Lake. By the way, Tiktikan Lake is named after the resident fish locals call tiktikan. 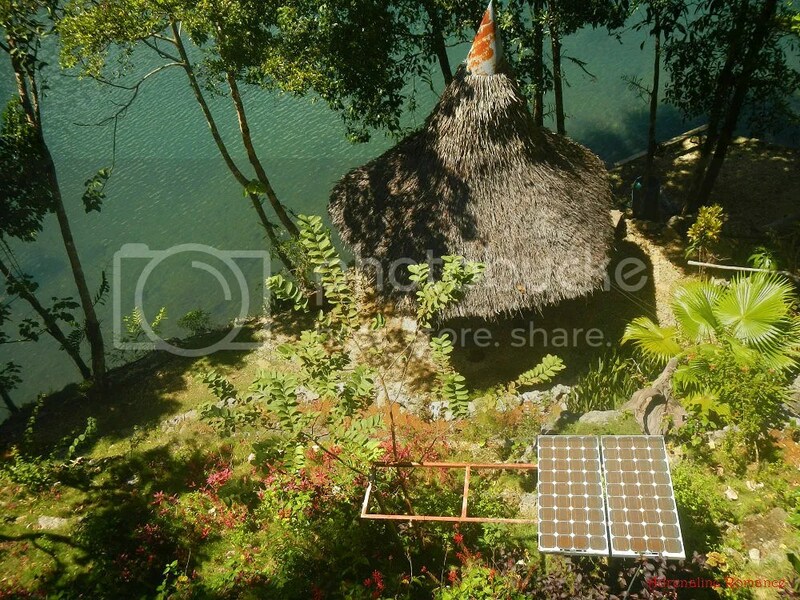 Solar panels provide electrical power to some small accommodation facilities at the lake’s shore. Since the electrical output is not enough, a generator may be switched on if there are enough people who decide to stay in the cottage houses. Bed spaces can be rented at a few hundred pesos per person. Sweetie and I decided to take a closer look at Tiktikan Lake. That’s easy to do as there are carved steps and pathways in the area. As you can see in the photo below, the “resort” is pretty much manicured and is a pleasant place to relax. The man-made adornments collectively form a pretty stark but complimentary contrast against the natural beauty of the lake. Paddling, anyone? The place has a few boats that you can rent out so you can paddle around the lake and surround yourself with nothing except the fresh breeze, the gentle waves, the cries of gulls, and ever-watchful trees. Tiktikan Lake is a relatively shallow lake, its water rising and receding depending on the tide. As confirmed by professional cave divers in 2013, there is an underwater cave that snakes deep into the ground and into the sea. 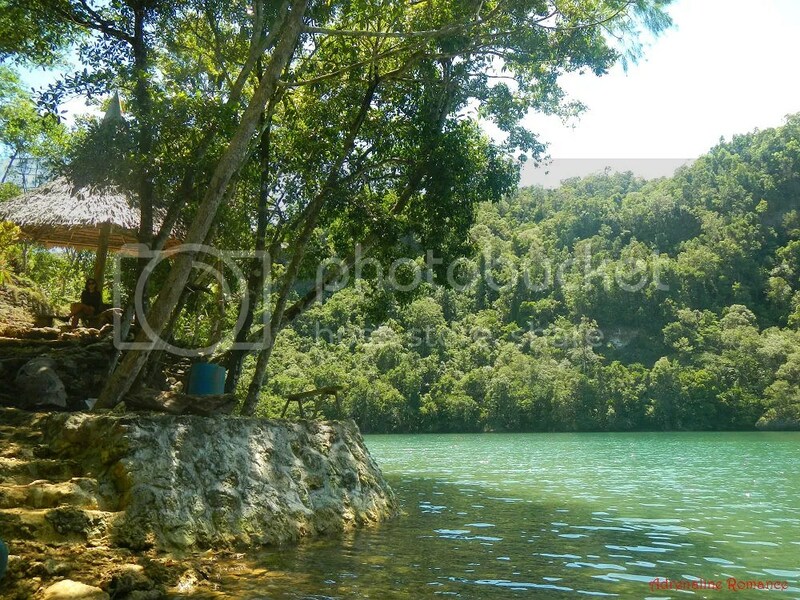 Before leaving Tiktikan Lake, we saw this diving platform at the side of the sari-sari store-house-registration center. Of course, you definitely know what is on our minds. See those nets and wooden posts? They form a pen where various fish and crustaceans (e.g. lobsters and crabs) are raised. It was time to raise our level of adrenaline a tiny bit! Before leaving, Sweetie rested for a bit at the end of the island’s small pier. Behind her lies the magnificent glory of Sohoton Bay. 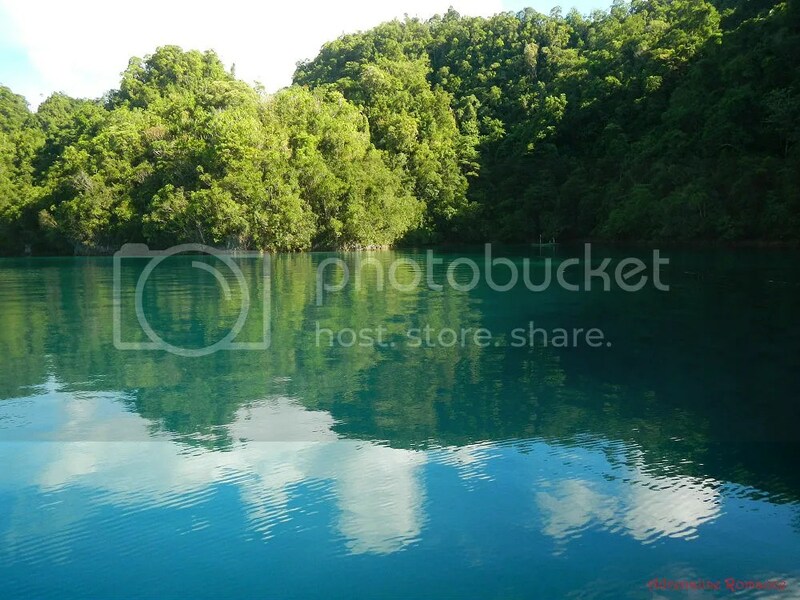 Satisfied with our visit, Vincent announced that the tide is now low enough so we can enter the highlight of this island hopping adventure—Sohoton Cove. 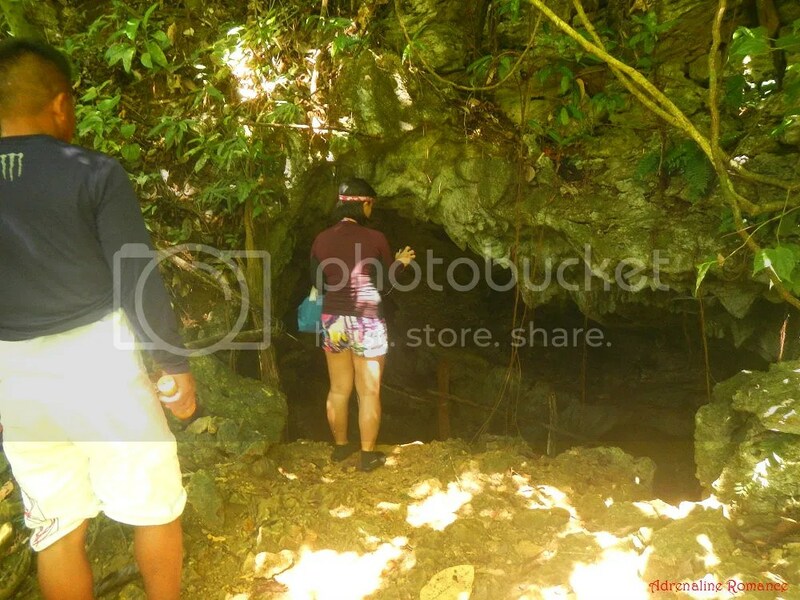 But before we bring you to the secrets of Sohoton Cove, let us take you deep inside the bowels of Bucas Grande in the next post. Alluring indeed “Adrenaline Romance”. I’m sure the place is so sweet and soothing. 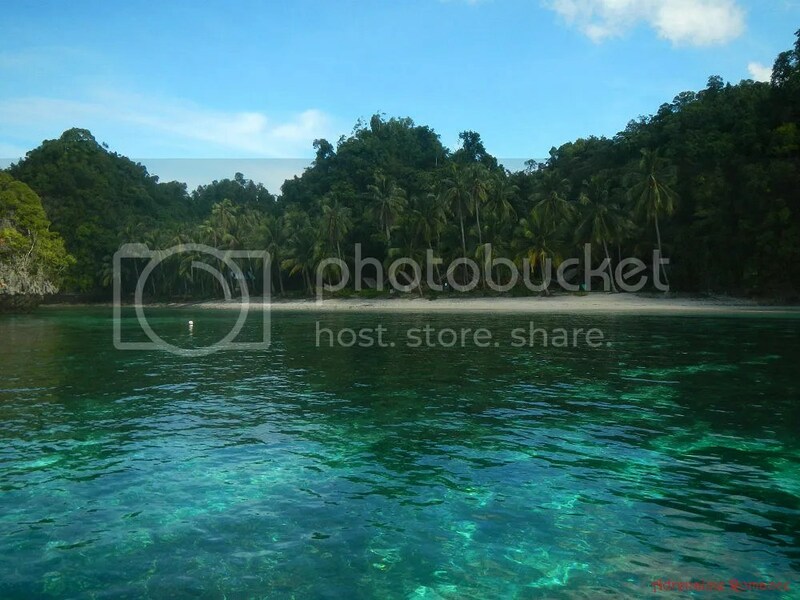 Oh yes, Sohoton Bay is definitely the place to be if you want to re-tune yourself to Mother Nature. Have you noticed or thought of a spot there ideal for yoga? We believe there are plenty of ideal spots there for yoga…beaches, stilted platforms, etc. The lagoon is one lovely piece of paradise. And I love that store in the middle of nowhere! Actually, we were really surprised that there was a store this remote. Amazing! You’re really get into the videos in this post! Looks like a great day out for most age groups. As always, love to read about your adventures and how much fun you guys are having. 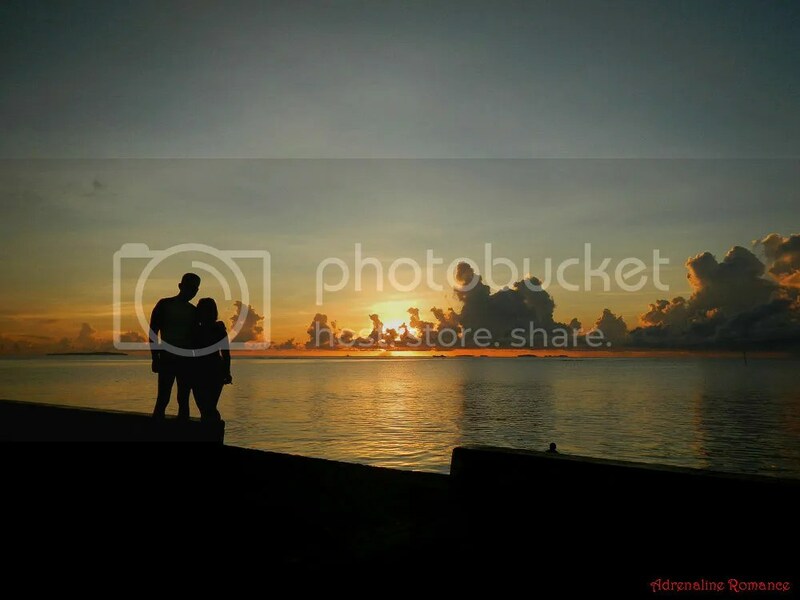 Your stories and the pictures are captivating. 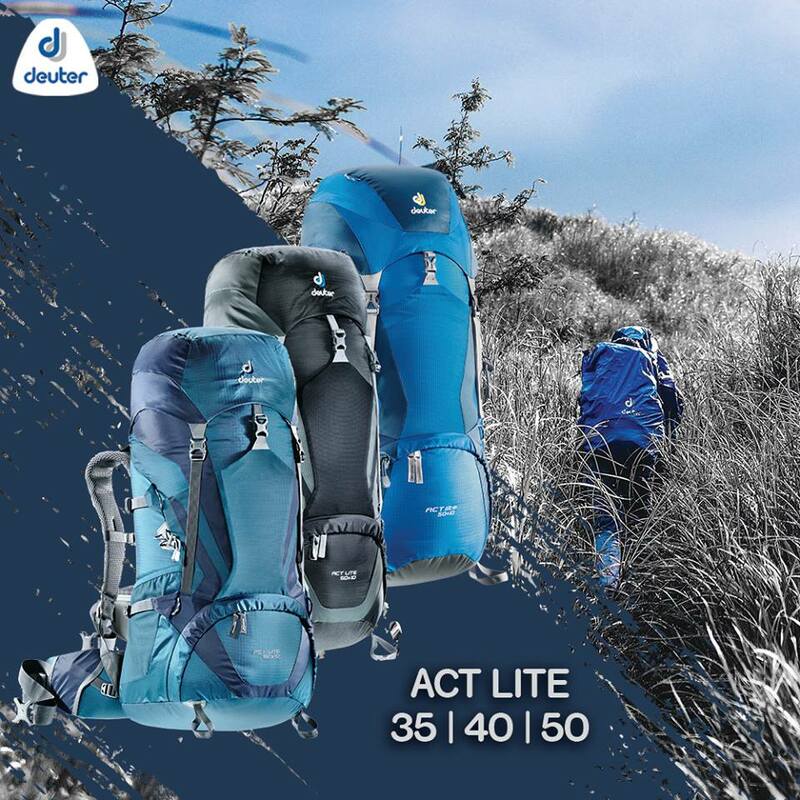 It makes the reader want to join you and enjoy the places with you. Thanks for sharing your adventures with us. Thank you so much. We would also like to give a huge thanks to you for constantly following our blog. We strive to make our blog as detailed as possible so readers can witness not just the beauty of our country but also experience (in pics and text, at least) the rich culture and life that makes the Philippines as it is. Hopefully, our tales will encourage them to pack their bags, buy airline tickets, and step into our country of lovely sights and exciting adventures. We also strive to make our blog as useful as possible for readers who want to visit the places we’ve set foot on or experience the activities that we’ve done. 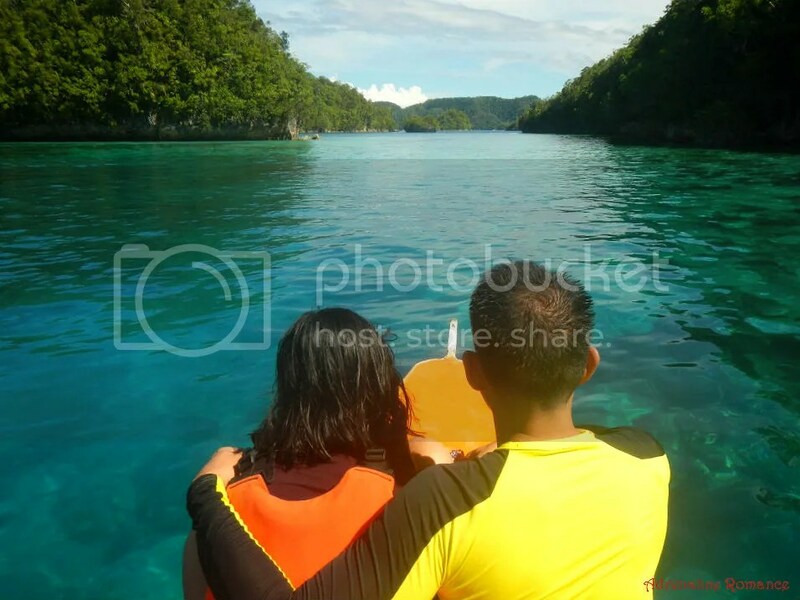 Regarding your query, check this post for our Day 1 itinerary and this for our Day 2 itinerary (our actual Sohoton Cove adventure). Scroll down to the bottom for tips, fees, and budgets. 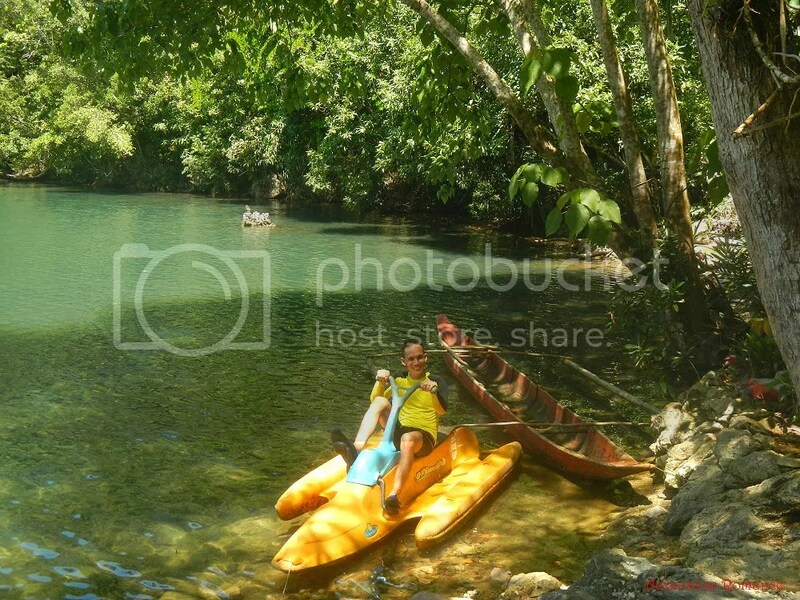 Go to the Bucas Grande/Socorro Tourism Office (near the port) so they can help you find a boatman/guide to take you to Sohoton. We are not sure about Tres Islas—are you referring to White Island, Daku Island, and Guyam Island in Siargao? If so, click this link for our itinerary. Scroll down to the bottom for tips, fees, and budgets. Please note though that these are itineraries based on OUR schedule. Thus, you may have to adjust a little bit to accommodate your schedules. That is pretty expensive. 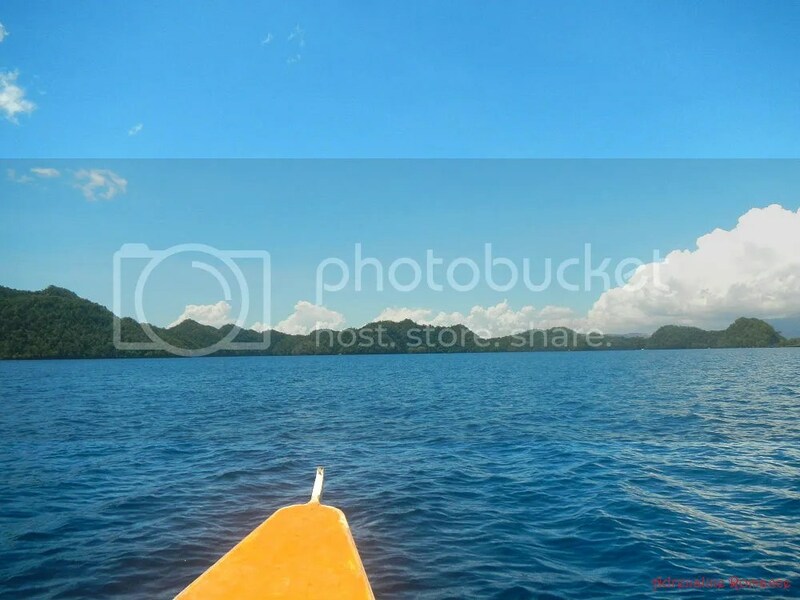 Did you take a chartered boat all the way from Siargao to Sohoton Bay/Cove in Bucas Grande? If so, then that is definitely and understandably expensive due to the distance involved in the trip. 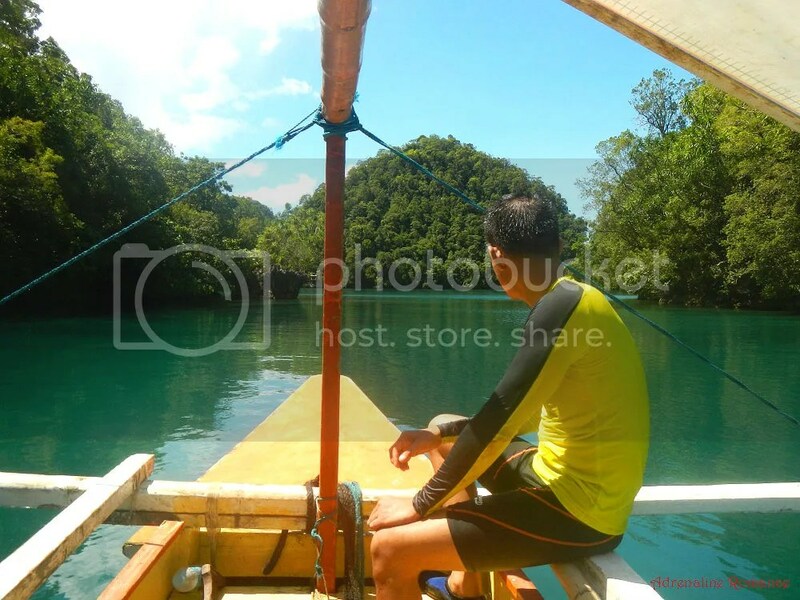 In addition, going from Siargao to Sohoton Bay/Cove requires traversing open water; we guess that’s why he wanted to go back to Siargao ASAP due to the danger involved in open-water crossing. 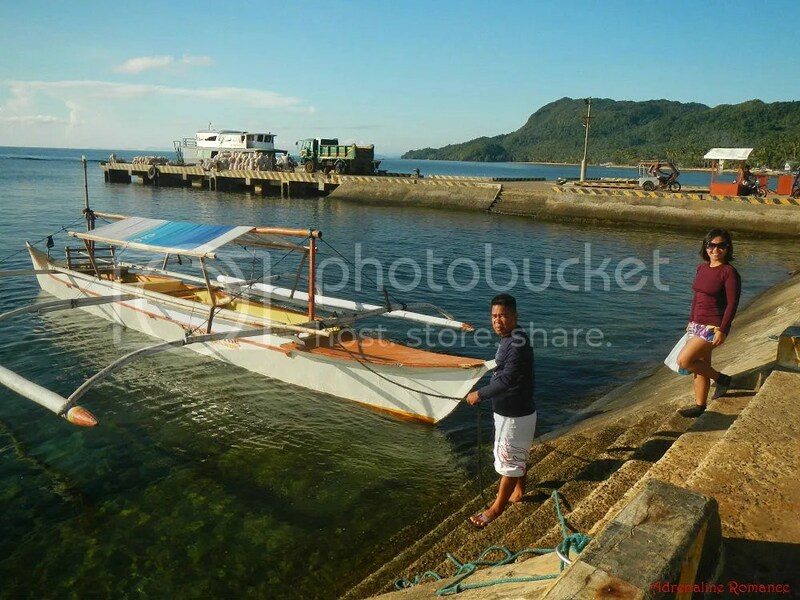 We were able to save money because we took the normal commercial large ferry pumpboat that travels from Dapa, Siargao to Socorro, Bucas Grande daily. 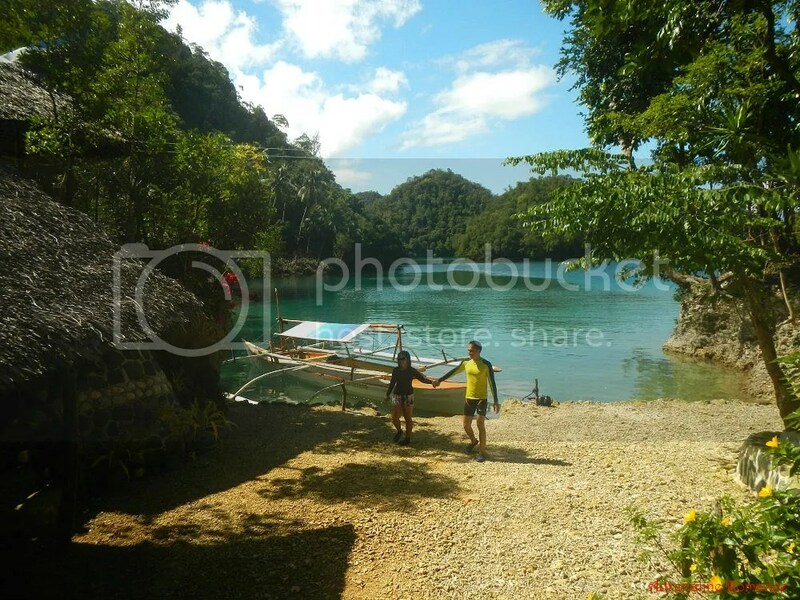 Then from Socorro, we sought the help of the Tourism Office to book us a boat to Sohoton Cove. Yup, it wasn’t cheap but maybe that’s the price we have to pay for not being prepared. 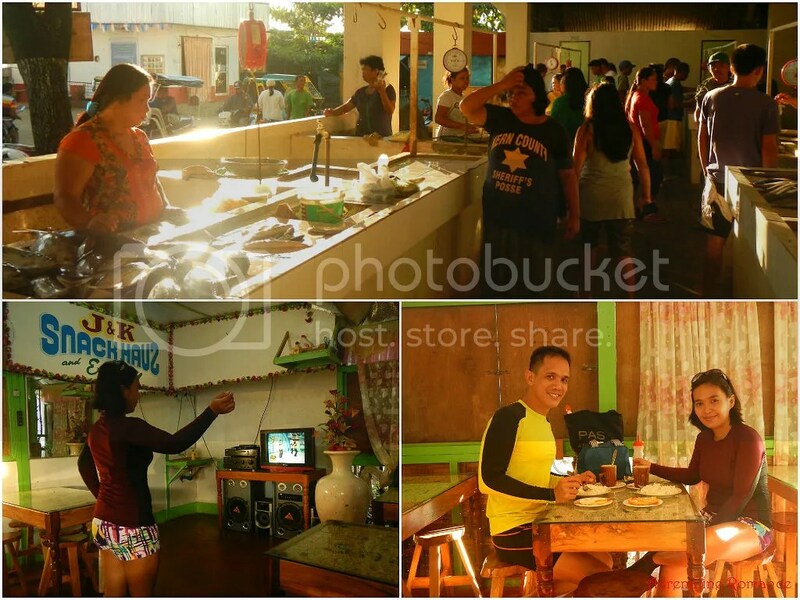 How much po rent niyo sa bangka for inland tour/island hopping? If we recall correctly, we only spent less than 4K for the two of us for everything. Check out this link, and scroll down to the budget section. We placed an estimated budget there. Wow, that’s a good deal! Sa Hayanggabon Port po ba kayo sumakay for Dapa? Will check the link, thank you po. Please call me Mavic. We came to Siargao from Cebu by air. So from the Siargao airport, we simply rode a tricycle to Dapa port where we took a commuter ferry to Socorro, Bucas Grande. Yup, I’ve come across that info po in your blog post. I asked because I found out that there are two jump-off sites for Bucas Grande tour. One is Pier 1 and the other is Hayanggabon Port. Siguro pareho naman may byaheng papuntang Dapa, Siargao, ano po? We only know that there is a commuter ferry that goes to Socorro with its originating point at the port of Dapa. We’re not sure if this is the Pier 1 you are referring to. We are not sure about the routes/schedules in Hayanggabon Port in Claver because we haven’t been there. Thank you for all the information, Ms. Shiela. I found your blog posts and your suggestions very useful. I wish I had come across your blog before our trip. It could have saved us a lot of trouble. I’ll take note of that. hehe Happy weekend!